Last week, Barack Obama came to St. Paul to declare victory in the Democratic nomination battle. 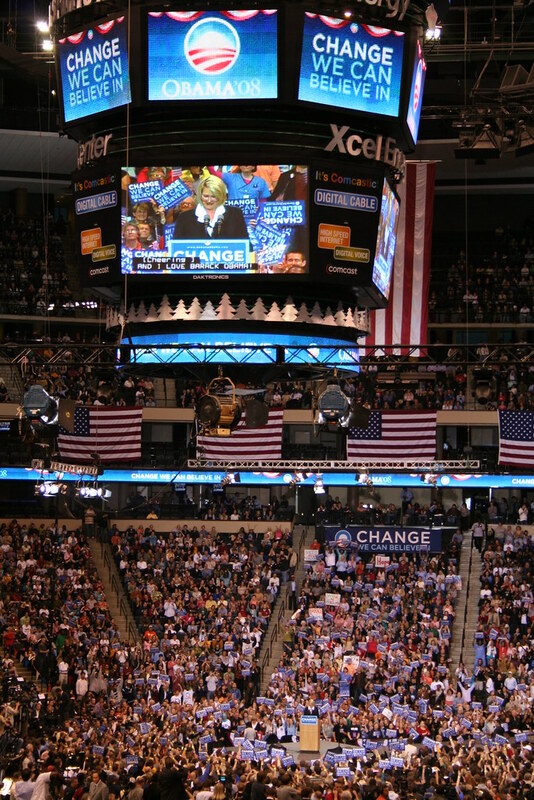 The rally was downtown at the Xcel Energy Center. I attended with colleagues Shilad Sen, Andrew Sheppard, and Rich Davies and some of their wives/friends/colleagues. Doors were set to open at 7:00 pm. We managed to find the back of the line about 6:15. Rich appeared mysteriously -- he said he'd been tracking the rest of us from the opposite side of the line for several blocks. We got in line on Kellogg between Wabasha and Cedar (about 0.85 miles from the front, as it computed later!). The line continued to grow at a walking pace as people streamed past us on both sides. As we were waiting, we did a little awkward Internet surfing on Shilad's smart phone and discovered that Barack had only 10 delegates to go. This would be the night! Bob Collins at MPR created this map of the line as part of his excellent writeup of it. As it turns out we were only about halfway back! We had been doing some math. I'd estimated that 3 people per foot of line: this converts to about 1.25 miles for 20,000 people, the approximate capacity of the Xcel Energy Center. While we were waiting, Rich counted counted people and came up with a much more generous figure of 1 person per foot. As it turns out, however, 17,000 people got in while 15,000 more had to watch on the jumbotrons outside. Assuming that 1 mile of line got through the doors, that's 3.2 people per foot; if the total line containing 17+15 = 32,000 people was 1.7 miles long as Bob Collins figures, that's 3.6 people per foot. Anyway, we stood around for a long while, until 7:30 or so?, with one false start where we gained about half a block. Then the line started moving and we shuffled slowly towards the Xcel. On 5th St. we got word by text message that no food or umbrellas would be permitted inside. This reminded me that I was carrying my Leatherman tool -- yipes! However, one of Katy Sen's friends was kind enough to let me go back to her car and stash my tool inside. So there was a mad dash by me several blocks up St. Peter and back to the line. After 2.5 hours waiting we finally got through the doors and wound our way through the bowels of the Xcel to some really excellent seats. I was surprised that they were still available since the place was mostly full when we arrived. We didn't have long to wait. First up was JoAnn Syverson, someone I didn't know. Turns out she is a communications professor at the U of M and didn't hear until the day before that the campaign wanted her to introduce Barack. Anyway, she gave an excellent speech. Her body language read clearly even though we were so very far away. We were expecting another introductory speaker, but no: "Ladies and gentlemen... please join me in welcoming Michelle Obama [crowd stands, loud cheering begins] ... and the person we know will be the Democratic party's nominee [louder] and the next President of the United States, [even louder] Senator Barack Obama!" The crowd goes absolutely bananas. Pandemonium continues. It takes a minute and 44 seconds from when Barack Obama comes to the podium until the crowd calms down enough for him to speak. Talking about education ("recruit an army of new teachers") - 0:40, though basically the crowd went nuts for the whole sequence, to the degree that I had to read what he was saying off the Jumbotron since I couldn't hear it. Thank you, Minnesota - 0:29 until the end of the video, though the crowd more or less went crazy for the whole last 3 minutes of the speech, starting with "America, this is our moment!". "Because if we are willing to work for it, and fight for it, and believe in it, then I am absolutely certain that generations from now, we will be able to look back and tell our children that this was the moment when we began to provide care for the sick, and good jobs to the jobless, this was the moment when the rise of the oceans began to slow and our planet began to heal, this was the moment when we ended a war, and secured our nation, and restored our image as the last, best hope on Earth. This was the moment, this was the time, when we came together to remake this great nation so that it may always reflect our very best selves and our highest ideals." And that was it. What a night. I will be incredibly proud to cast my vote this November. My friend Bill Lindeke's blog post. MSNBC calls the nomination for Barack (video). John McCain also gave a speech June 3. 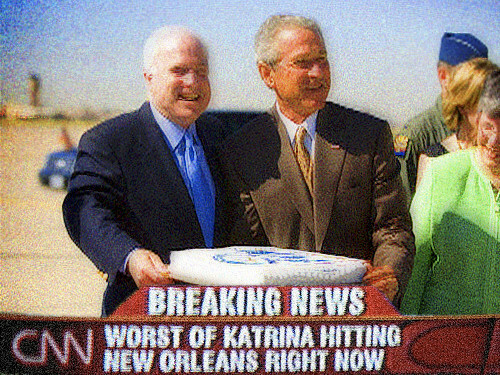 And, well... even Fox News thought it was awful. Attendance was 600. I won't subject you to the whole thing, but here is a mashup between McCain and Obama on June 3. Don't miss the dehydrated babies line at 1:20. Hey, Reid, Maureen, Karen, and I were there in line, too. We joined the line at about 6:30, and were quite a bit behind you. We barely got in as Obama started his speech, and found standing room only up on the top level of the Xcel. I think we were about at 6th street, if that helps your people vs. miles computations. Hi Reid, thanks so much for blogging on this. I couldn't make it to the speech and it's wonderful to hear a first hand account of somebody who did. It's also good to know that you could secure a seat without having to get in line days in advance.